Healing Your Broken Marriage – CounselCare Connection. P.C. Your marriage vows have been broken. Or your spouse has lied to you, abused you, neglected you. What can you do? You have entertained divorce. But, that seems so painful, more painful than reconciliation. And you think about the possibility of working on your marriage and seeing what would happen. It’s a risk. It’s even scary. You’ve prayed. You’ve wept. Can your marriage be saved? Can God do something to bring healing? Can you forgive? Can you trust him/her again? I want to guide you through some steps in this course: Healing Your Broken Marriage. Steps which when applied to your life and relationship will help you regain hope and work towards reconciliation, putting the past where it should be: in the past, and moving forward. If you know Jesus Christ, then, pray and ask Him to help you through this process and this journey. With Christ you and your spouse can begin again, put the affair, the issues and the hurt behind you. When you became a Christian, Jesus gave you a clean slate and helped you to start over. He forgave all of your sins. Your spouse is a sinner as you discovered early in your relationship. Maybe you can begin now to consider the idea of forgiveness. There are the steps I want to Help you work through: Hoping again, Grieving, Forgiving, Rebuilding Trust and Expressing Yourself. What will give you hope that you can work through this trauma with your spouse? On a human level, you and your spouse have no doubt worked through trials and disappointments in the past. You have both probably forgiven each other for hurtful words, unkind actions, disrespect, forgetfulness, conflict. Most couples work through issues. Maybe you haven’t worked things out as satisfactorily as you would have liked. Maybe you are still holding on to some resentment and feelings of disappointment. When your spouse lets you down, you remember the many times he/she has done this in the past….. so, the pain is pretty deep. There are two considerations here. Your ability as a couple to work through issues in the past can give you hope for the future. But, your deep resentment about the past will greatly dim the hope you might have. Ps 25:5 guide me in your truth and teach me, for you are God my Savior, and my hope is in you all day long. Ps 25:21 May integrity and uprightness protect me, because my hope is in you. Rom 15:13 13 May the God of hope fill you with all joy and peace as you trust in him, so that you may overflow with hope by the power of the Holy Spirit. Hope from God springs up like a fountain, even when life is at it’s bleakest. It’s ok to be broken. It’s ok to grieve. You must go through that process to come out stronger. Hemingway wrote: “The world breaks everyone….. but, many are strong at the broken places”. Will you try? Can God give you the strength to work through the brokenness? Are you willing? God is ready to help you. In Matthew 19:26 “Jesus looked at them and said, “With man this is impossible, but with God all things are possible.” (NIV) Do you believe this? If you and your spouse are separated, I would recommend that your read this excellent book: Hope for the Separated: Wounded Marriages Can Be Healed by Gary Chapman. Once you face the reality of a loss like an affair in marriage, or the pain of abuse, you need to begin to grieve. Because grief is a process and can’t be cut short, someone said, “The only way out of grief is through”. Grief forces you to deal with and face the pain of loss, betrayal, fear in the marriage. When your spouse has betrayed you through an affair or abuse….. it seems like he is no longer the person you married. It seems like you have lost that person and now, someone else is standing in his/her place because they can no longer be trusted and no longer have the same character or values you once knew and once trusted. But, first you need to determine how to work your way out of the grief and understand what you are experiencing. There are many ways to look at the grief process. Dr. kubler-Ross identified this pattern in dying patients: denial “there must be some mistake”; anger “why me?”; bargaining…an attempt to postpone; depression: sorrow over past losses & that to come; acceptance/ reorganization. 3. Disorganization/despair; bereaved finds it difficult to function in environment. 4. Reorganized behavior…beginning to pull life back together. feelings of helplessness and hopelessness, anxiety, loneliness, confusion, yearning. Difficulties with faith, socialization and maintaining normal activities for a time. the normal stages of grief and loss: shock, protest, disorganization, reorganization. “After a significant loss like betrayal many people have the sense they are going crazy, particularly if they have not sustained a major loss before.” But, you are not a helpless victim of grief. There are actions you can take to help you work through this loss. Facing the loss with God’s help, placing your hope in Christ, your Savior, experiencing the feelings and work of grief can bring you healing. …difficulties thinking/ concentrating, indecisiveness nearly every day. *If you or someone you know is contemplating suicide, get immediate help by calling your family physician and the American Association of Christian Counselors or the National Board or Certified Counselors. The Bible talks about grief. Gen. 6:6 reads “He was grieved in His heart.” Who is this talking about? God. He experienced grief; He knows what it is like. When you enter into grief, you enter into the valley of shadows. There is nothing heroic or noble about grief. It is painful. It is work. It is a lingering process. But it is necessary for all kinds of losses. It has been labeled everything from intense mental anguish to acute sorrow to deep remorse. There are a multitude of emotions involved in the grief process- emotions which seem out of control and often appear in conflict with one another. With each loss comes bitterness, emptiness, apathy, love, anger, guilt, sadness, fear, self-pity, and helplessness. Naomi not only lost her family, she lost her providers and her dreams for the future. Ruth, Orpah and Naomi wept. Naomi faced reality…she couldn’t provide a husband for them. She expressed anger, and bitterness “The hand of the Lord has gone against me.” “The Almighty has made my life very bitter.” She felt hopeless about the future and her circumstances. Ruth 1:20-21 “Don’t call me Naomi,” she told them. “Call me Mara, because the Almighty has made my life very bitter.21 I went away full, but the LORD has brought me back empty. Why call me Naomi? The LORD has afflicted me; the Almighty has brought misfortune upon me.” Naomi felt disappointed, angry towards God. Even so, Naomi and Ruth did what they knew was right and trusted even when they couldn’t understand why God allowed the trials to take place. Then, God provided a redeemer in Boaz for them. Matt 26:42 He went away a second time and prayed, “My Father, if it is not possible for this cup to be taken away unless I drink it, may your will be done.” ***Naomi & Jesus felt the pain of suffering and grief yet endured it & submitted to God’s will…. How can you keep from falling apart and “Ride out the storm of grief”? Will this devastation in your marriage shatter your life forever? Grief gives us only one place to go….God. In the face of loss, hardship & uncertainty you can.. Discover power in grief by allowing the pain of grief to move you towards God & to learn to rely totally on Him. When you discover that only God can comfort & His presence is more of a reality than ever before…. you discover what’s good about grief and how you can face the future. A. Surrendering and acceptance and prayer: You can use loss to help your faith grow and move you towards reliance on Christ. Let the pain of grief, hurt and woundedness draw you to Christ. …God hears your prayers, provides comfort and rest. B. Since “the only way out of grief is through” you need to work through the stages of grief: feel the pain, express it in healthy ways through journaling, prayer, counseling, a close friend. Depend on God for strength to take on new responsibilities and the work of restoring your relationship. Pace yourself. Let other people help. It is at this turning point in your life that God works on you and through you….on your character, perspective, behavior helping you to become more Christlike. What do you need to do to get to the point of living with the loss and the feelings of betrayal in a healthy way? These steps can be helpful for most types of losses. 1. Admit you have experienced a trauma but, that you can go on with the help of God. You need to confront and forgive your spouse who has abused or betrayed you. 2. The next step is to develop your own self and your life to encompass and reflect the changes that occurred because of your loss. Developing self-respect and self-esteem is important in the case of an affair or abuse. It is one thing to work through the grief, it is another thing to make grief …… the affair, the abuse….the focus of your whole life. You need to deal with it and begin moving forward. Move forward now by considering how to forgive your spouse. 6. When it’s still hard to forgive, we can place our trust in God Who will someday judge all the wrongs in the world. We can leave revenge and justice up to Him….. because Proverbs 20:22 says “Do not say, “I’ll pay you back for this wrong!” Wait for the Lord, and He will deliver you.” and Paul writes in Romans 12:19 Do not take revenge, my friends, but leave room for God’s wrath, for it is written: “It is mine to avenge; I will repay,” says the Lord. Revenge won’t give you the peace and satisfaction you need. Revenge and or punishment will only serve to destroy you and your marriage. 7. When we are stuck in unforgiveness, we can ask to talk and pray with a confidante, a pastor or a counselor to help us deal with the resentment and hurt we feel towards the offender. This will provide a context for release of the painful feelings we are experiencing, provide support, and a better understanding of our spouse and our situation. Therefore, we can conclude that divorce is allowed by God biblically when there is continued unfaithfulness. Seek pastoral advice regarding this. Read more about affairs and advice for relationships. What does it mean to trust another human being? What should my reaction be when my spouse or significant other breaks my trust through an affair or abuse? Is it possible to rebuild trust in a relationship? First I want to emphasize that trust begins and ends with God. The next fact is that trusting another person has to have a certain expectation of failure and thus be combined with a willingness to forgive. Another point is that you don’t put in a quarter and out drops a can of trust- trust grows over time. People are complex, broken beings therefore, previous hurts, fears or losses can impede their determination to trust and/or be truthful in a relationship. But, people have the capacity to grow in trust and truthfulness. You and God can help build trust into your relationships. Hebrews 12:1-2 talks about how we need to “fix our eyes on Jesus the Author and perfecter of our faith”. Faith comes from God. Our faith is in God. God is the only One who is eternally and truly faithful. He is the giver of faith and the object of faith. Because of those facts, we need a new understanding of what it means to trust people. What it means to trust a spouse again who has broken trust with you. But when you are let down by your spouse who breaks promises or doesn’t meet your expectations because he/she is human and fallible, then your trust must remain focused on and in God versus him/her. You can trust God for your spouse and trust Him to help you through the times he or she may disappoint you. Read more about Faith. Trusting grows in relationships over time….because as you spend time together with someone you build understanding and authenticity. You gain insight into another person’s needs, motivations and fears. Unconditional love develops trust because as you express God’s agape type of love towards someone- generally he or she will sense your acceptance and feel comfortable to be vulnerable and honest about their feelings. Agape love actually builds self-esteem in others and alleviates their fears of rejection. People learn that they can be authentic with you about their feelings, opinions, and failures. The result is a growing trust in the other person. Not because that person is perfect but because that person is growing in honesty. When love is not patient or enduring; when love is unforgiving and always disappointed… looking for something to go wrong, it generates fear in the other person. Fear-based love is conditional and creates an atmosphere of distrust, dishonesty and instability. You can have a limited trust in your spouse as you grow and recover from the abuse or the affair. Actually, your taking a risk to trust your spouse again will help to build his/her confidence and desire to live up to your expectations. You can stilll be aware that he/she may let you down because they are human. That is reality. That is why Christ had to die for the sins of the world….because you and I and your spouse can never totally keep the law and live perfect, righteous lives. God can claim to be perfectly faithful in everything but we cannot because we are still sinners. The only thing you can promise is that you want to seek God and ask Him to change you to make you more like Christ. Then you and I will become more trustworthy in our relationships, though still not perfect. As Christians you and I are still in the process of sanctification and we still fight sinful tendencies within us (Rom. 7). None of us is perfect. Because of God’s forgiveness through Jesus’ sacrifice on the cross, you and other Christians are cleansed, righteous, and justified before Him. 1 John 1:9 says “If we confess our sins, He is faithful to forgive our sins and cleanse us from all unrighteousness”. That verse says that since you (and others) still sin you need to continue to confess those sins to keep your relationship with God unobstructed. That is exactly what needs to happen in human relationships. You and your loved one will still hurt each other, therefore, you both need to become better forgivers and confessors. That ability to reconcile and spirit of humbleness will prove the depth of your love and commitment. The components of love, forgiveness and commitment are as important to trust in a relationship as is honesty. Forgiveness gives you the chance to start over and trust another fallible human being again. When Christ is at the center of your lives- your marriage or other close relationships will prosper greatly. You will no longer have to hide who you are because you know you are forgiven in Christ. You and your loved one will no longer have to be worried about rejection because “there is no condemnation in Christ” and “nothing can separate you from the love of Christ” Rom. 8:1, 39. Hiding, sin and fears of rejection can be overcome by the love and presence of Christ in our lives. Jesus helps us to become more authentic in relationships- expressing honesty, openness and letting others see our frailties and failures. And even when others reject us, we can be honest and open because we are certain that Christ will never reject us and that He loves us unconditionally. With Christ you can start over with people and determine to put the pain and hurt behind you. With Christ you can trust another Christian again because Jesus is at work in his or her life. You’ve been feeling very hurt about the affair or abuse in your marriage. Now, it’s time to express your feelings and make a plan at the same time to work on your marriage. You need to be able to make some requests which will bring real healing and growth in your relationship. Write out what you are disappointed with. You may make other more practical requests such as planning a time to talk about how to discipline children, what chores to complete around the house, social and recreational activities, or planning a budget. You may ask that he/she attend an anger class if there has been abuse. This is really a necessary step for your relationship when anger and abuse are the issues in your marriage. See the Anger Management Institute: What’s Good About Anger? resources, DVDs, courses & coaching. 3. Learn to work through conflict together. Negotiation is one of the keys to restoring your communication and learning to collaborate on decisions. Negotiation starts with the premise that the other person’s needs are just as important to him or her as your needs are to you. Nagging, shouting, or being angry or coldly rational usually won’t get others to change their view. Negotiation allows you to find a middle ground when you have a conflict of needs or goals so each person can get something and you can actually work together to achieve the goal. Listen to the other person’s objections. The purpose is to understand his/her position; not to argue or try to convince him/her to give up his/her needs. Be an active listener by using open responses, asking questions, clarifying, and paraphrasing what you understand the other position to be. Don’t be afraid to hear and show support or even empathy for the other person’s view. Just because you understand it doesn’t mean that you have to agree with the point or accept the opposing position. From the information you have gathered, you can take the next step. **Make a proposal. Your proposal should take into consideration what the other person needs or wants in this situation. If he/she accommodates you, is there something in it for him/her? Be creative and flexible, breaking through the constraints of rules or traditions. **Make a counterproposal. If the other person won’t accept your proposal, encourage him/her to come up with a different solution. People unfamiliar with negotiation and collaboration may need some help getting started. Remind them that your objective is to understand their position and to find a compromise that both of you can live with. You might even say, “I really want to go to Hawaii after this seminar. This is really important to me. What would you need me to do to make it worth your while to go along this time?” I’ll get a second job to afford it or…. Obviously, compromising doesn’t include compromising your values…. 1. Your spouse must break off the relationship completely. This is mandatory. Your spouse can no longer have contact with the former lover. A final letter of closure to the relationship can be written…. ask your spouse to show it to you. Maybe you need to consider getting all new phone numbers. Maybe your spouse will have to change jobs, because he or she cannot be seeing this person at work anymore…… that will be too tempting. In the Old Testament, Joseph ran from Potiphar’s wife who tried to seduce him. That is a principle: run from temptation and don’t put yourself in a situation where you will be tempted. Paul writes in 1 Corinthians 10:13: No temptation has seized you except what is common to man. And God is faithful; he will not let you be tempted beyond what you can bear. But when you are tempted, he will also provide a way out so that you can stand up under it. (NIV) God can and will help us escape temptation. But, we must be willing to obey Him and let Him control our lives so, we have spiritual power to overcome and avoid temptation. 2. Your spouse must end the abuse. This is also mandatory. Your relationship cannot weather more abuse. If this abuse is verbal, then, you both need to attend marriage counseling to learn to change communication. If it is physical abuse, then, your spouse must learn anger control as suggested above….. take a class, go to counseling, take a seminar, go to an anger control support group. And it would be helpful for you to learn how to stop provoking his/her anger and how to bring up problems and issues in an honest, direct yet loving way. 3. You and your spouse need to work on your marriage by going to counseling and to a marriage seminar. If he or she is not willing to do this and you have evidence that he/she lying about seeing another woman or man, then, you must ask him/her to move out and seek legal as well as counseling advice. You and your spouse can rebuild the romance in your marriage when you move through grief, forgive, begin to restore trust and build your communication together. You can decide to become your mate’s greatest encourager..
1. Make a decision to never again be critical of your partner. Turn your complaints and criticisms into requests. 2. Spend time developing a sensitivity to your spouse’s needs and build up those areas. 3. Spend time thinking daily of positive qualities and behavior you admire and appreciate in him or her. 4. Consistently express your praise and appreciation for your spouse. 5. Recognize your spouse’s accomplishments. 6. Husbands, publicly and privately show wife how special she is. 7. Wives, show your husband how important he is in your life. Ask his opinion and value his judgments. 8. Respond to each other physically & facially. 9. Be courteous to each other privately & publically. 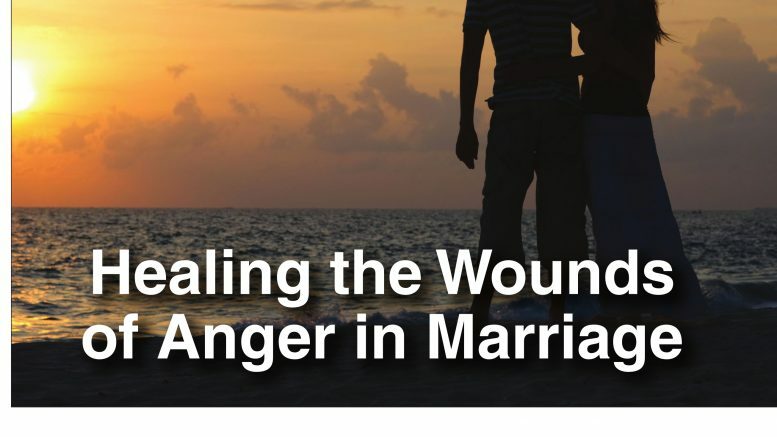 Order Healing the Wounds of Anger in Marriage today! Lynette J. Hoy is a Marriage and Family Counselor with CounselCare Connection, P.C. in Oak Brook, Illinois. Lynette regularly presents seminars on: women’s issues, assertiveness, “What’s Good About Anger?”, stress and conflict management, PREP’s “Fighting for Your Marriage”, grief and divorce recovery. Lynette is a National Certified Counselor and and credentialed by the National Anger Management Association as a: Certified Anger Management Specialist-V, Diplomate, Supervisor and Consultant. Contact her for seminars, articles or counseling needs at counselor@hoyweb.com or 708-341-5438. See web sites: www.counselcareconnection.org and www.goodanger.com .